Eat Our Brains Turned Me on to Duck Fat! Like I need another blog to read! Nevertheless, thanks to Shaken and Stirred, I just discovered Eat Our Brains. 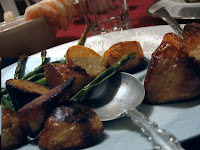 And my first exposure to the blog is a brilliant and hilarious discussion of the virtues of roasting potatoes in duck fat. Swooooooon! Seriously, don’t read the blog entry unless you’re prepared to immediately go out and buy duck fat and potatoes for dinner tonight. Yay! It's the NYT Dining Section! I really liked this week’s NYT Dining section. Like Frank Bruni’s headline, “Let’s Eat, Not Fuss,” the whole section seemed to have a simple, no-fuss approach. Which is appropriate, given that it was the 26th and we’re all suffering from holiday overload. - My in-laws are in town and we ate at a diner here in Queens last week called Georgia Diner; we had heard that it had fantastic diner fare. They did. But the coleslaw just looked nasty – lots of dripping mayonnaise – and my mother-in-law and I both passed on it. I told her I knew of an Ina Garten recipe for coleslaw that used olive oil and vinegar instead of mayo. 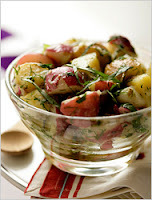 Well, the Dining section corrected my memory; it was a recipe for potato salad, not coleslaw. Whether it’s coleslaw or potato salad, it sounds so much lighter and more elegant made with champagne vinegar than gloppy mayo. "And so Amy died. The End." This is just the funniest damn thing I’ve seen in awhile, and it ties in quite nicely with my Little Women post: Meg Cabot does scenes from the Louisa May Alcott classic, using her Madame Alexander dolls. Thanks to Not Your Mother’s Bookclub for the link…and they apparently got it from Read Roger. Library's 1st Annual Mock Caldecott Event! Happy holidays to all! I’m at work today after a 4-day vacation and, needless to say, I’m having some focus issues. It’s never easy to be tied to your desk when the rest of your family is playing Uno and making fudge at home on a gray day. I said to my mentor beforehand: “Mark my words, The Wall won’t be anywhere near the top of the voting.” I was very very wrong. The Wall seemed to be the most polarizing, the most intriguing, the most discussion-inducing book of the group. Lots of opinions about that one. So what were the results? The other three books were very, very close so we only ended up with one Honor book. When the announcement was made, half the room erupted in cheers and the other half gaped because they couldn’t figure out how The Wall came out on top. Go figure. Kind of like the real awards, right? We’ll absolutely do it again next December – it was some of the best fun I’ve had since starting my job a year ago. In fact, there seems to be a lot of enthusiasm for a Mock Newbery too! YAY! Last Wednesday's Dining Section! It’s a little late to be sharing this, but last week’s NYT Dining section had a pretty good gift giving section (and the website features a nifty slide show) – it was such a relief to see some non-Williams Sonoma gifts! 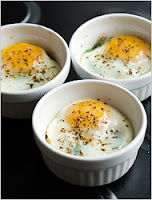 In fact, the article features some egg cups from the MoMA Design Store that I’m going to buy for ma petite famille – I don’t even want to tell you what I’ve been using for egg cups when I make Clotilde’s Soft-Boiled Eggs with Artichoke Bread Fingers recipe. Suffice to say, I’ve had to improvise heavily. Now it seems I can not only get some proper egg cups, but I can actually get some with a modern groove thang going on. Unfortunately, it appears you can't these online ...which means I have to trudge on down to friggin SoHo. Merde! 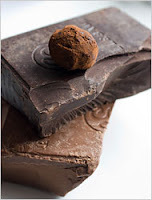 - There was also a chocolate truffle article that sounded pretty damn good. I’m not a sweets kind of gal, but I provide the recipe and picture here for posterity. - There was also a list of culinary books with an off-the-beaten-track flavor, but none of them stuck out much for me. I provide the link here, though, because it could be the last-minute gift you’re looking for. - I may not volunteer in a soup kitchen during the holidays, but I do donate well. Apparently Kevin Bacon does work for food banks…is it incredibly superficial to ogle the picture of Kevin instead of reading the article??? Yes, I know it is. So I did read the article and found some ideas for charities to donate to…and then I ogled Kevin. Can't afford the time? Then spend $10 less per person on your holiday list and send the leftover proceeds to a local food bank. Do what you can. - Pink champagne…or rosé champagne? It doesn’t matter. This article made me thirsty for “drama in a glass” (as quoted by Mireille Guiliano). Bon appetit and happy holidays to all! How Many Books Are Needed to Get "a Taste of Other Cultures"? The L.A. Times put together a short list of “Books that Give Kids a Taste of Other Cultures.” And I have some issues with this list. This is the best they could come up with? Really? I was so certain that the list was incomplete that I kept blindly clicking on links around the article, thinking maybe I hadn’t read the whole thing. But nope, this is it. Haven’t they heard of The Short and Incredibly Happy Life of Riley? Or Mini Mia and Her Darling Uncle? Or Glass Slipper, Gold Sandal: A Worldwide Cinderella? Sheesh. And these three probably still aren’t near the best of the newer titles – they’re just the first three I thought of. Either way, my point is that, if you’re going to put together a list like this, it should have more breadth and variety. Thanks to my daily Shelf Awareness email for the link. Though many of Stephenie Meyer's fans may have dreamed of being Bella Swan, star of the author's Twilight saga, actress Kristen Stewart (seen most recently in Into the Wild) will play Bella in the movie adaptation of Twilight, and Robert Pattinson (who appeared as Cedric Diggory in the last two Harry Potter movies) will star as Edward. Production of the Summit Entertainment film begins production next February and will be directed by Catherine Hardwicke (Lords of Dogtown). Melissa Rosenberg (Step Up) adapted Meyer's novel for the screen. Cedric Diggory as Edward???? Swoooon! And yes, of course, I dream of being Bella. But, you know, less whiny and way more capable of self-defense. But the big question still remains: who did they cast as Jacob???? Yeah, I know. I took an unannounced hiatus from the blogosphere, which I think is a total faux-pas. Particularly when I’m just getting started. But it is what it is, right? The point is that I’m back and ready to move forward. ~ Ooooh, absinthe! Seriously, people, it’s back! My local French restaurant has it on the menu as an aperitif, and the Times is writing about it. The article was actually really interesting because it goes into the history of absinthe, why it was banned, and the exciting innovations going on today. You’ll read this article and be half-tempted to buy a bottle…except that the good stuff cost upwards of $65 for a bottle. Yikes! I hate to plop down that kind of money without some sort of reassurance that I’m going to thoroughly enjoy it. And I’ve never tried absinthe so that guarantee is completely lacking. But if I do try it, you’ll be sure to know. ~ Wine prices are going to go up. Which is really not good news for a blog with “pinot” in its name. Will that stop me from spending half my paycheck on the grape? Never. ~ There was an article on the death of the entrée. But it didn’t do much for me. The entrée is over? Who cares? I just want to eat good food, whether it’s on one big plate or lots of little ones. Just make sure it’s quality. ~ There’s a recipe for Bulgar Pilaf with Chestnuts and Spicy Tangerine Brown Butter. Am I the only one that thinks that sounds insane?! But they wouldn’t put in the Times if it were total crap, right? Right? So naturally I’m tempted to try it. ~ Okay, I hesitate to even mention this next bit because it makes me a hypocrite. But there’s a blurb about cured ham from Spain called Jamón Ibérico. It cures for more than two years and will cost you a pretty penny at $50 a pound. Apparently, it hasn’t previously passed U.S. health inspections, but now it has and it’s coming to the States. Part of me is thrilled – I’m sorry, but I would happily pay $25 for a half-pound experience. However, having read Omnivore’s Dilemma and Animal, Vegetable, Miracle, I know what sort of carbon footprint my $25 purchase is making. But damn! I want to try that ham! And that, ladies and gentlemen, was the NYT Dining section last week. Cool, eh? A proper re-debut for my blog. Now, go forth and, for heavens’ sake, eat well.